Up to 50% off American Journey. Save an extra 10% on American Journey with every Autoship order. Save an extra 5-10% on every Autoship order of these top brands! Save 5% on Purina Pro Plan with every autoship order. Up to 40% off Goldfish Food. Up to 33% off Dog Bowls & Feeders. 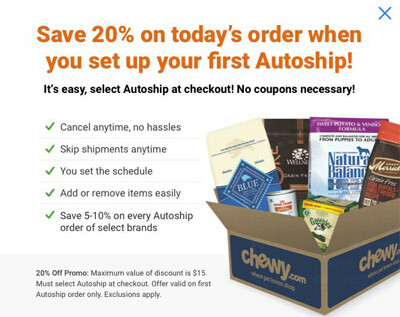 Save 20% on today's order when you set up your first autoship. Up to 30% off Bird Cages & Accessories. Up to 30% off Reptile Habitat Accessories. Chewy.com is your online source for pet food and products. The store carries of 70 brands and offers products like dog food, dog treats, potty pads, cat food, cat treats, cat litter, flea and tick treatments. soap and more.